The spokeswoman for the president of the United States won't say whether the American press is or is not “the enemy of the people.” This phrase was used to similar effect by the Nazis and in the Soviet state under Stalin to designate who should be murdered. It's un-American, and so is she, and so is Trump. White House Press Secretary Sarah Sanders was in fine form during a press briefing today, in which she repeatedly refused to answer a CNN reporter's question: Do you believe the press is “the enemy of the people”? President Donald Trump uses the phrase often, and so do his fans. You know where it comes from? Its use in this context comes from the Nazis, and from Stalin, and more recently, modern Russia. That's who uses it now. Russia. 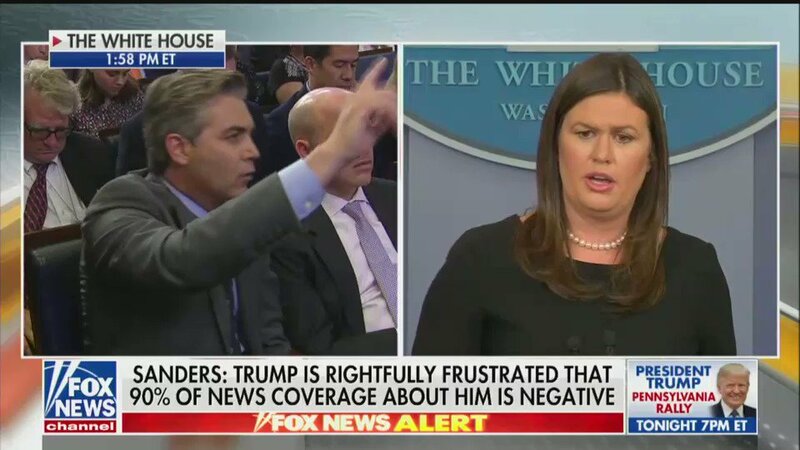 Sanders' exchange with Jim Acosta came after she bashed CNN, the organization Acosta works for. Throughout the briefing, Sanders used provocative language to mock the reporters she was addressing, in a denigrating and shouty tone. This is a thing she does. This is a thing her boss wants her to do. They call reporters “the enemy of the people,” because some of their “base” likes this and it helps them retain power. It really happened. It was really weird. It's all noise, and it's not the real news of the day. But we have to stop and remind ourselves and each other that this is now happening. It's not okay. It's not normal. We have to stop it.